Studies have shown that treating high blood pressure (BP) is one of the most important strategies to slowing the progression from chronic kidney disease (CKD) to end-stage renal disease (ESRD). Currently, a BP goal of less than 130/80 mm Hg is recommended for patients with CKD, a target lower than the goal recommended for people without CKD (less than 140/90 mm Hg). Despite the dissemination of clinical guidelines, meeting BP targets in people with CKD may be difficult in clinical practice. Few studies have investigated the association of each BP component with ESRD risk. In Archives of Internal Medicine, Dr. Peralta and colleagues had a study published that investigated the independent association of systolic BP (SBP) and DBP with ESRD risk in patients with CKD who participated in the Kidney Early Evaluation Program (KEEP), a nationwide kidney health screening program offered by the National Kidney Foundation. More than 16,000 patients in KEEP were studied in the analysis, all of whom had at least stage III CKD. 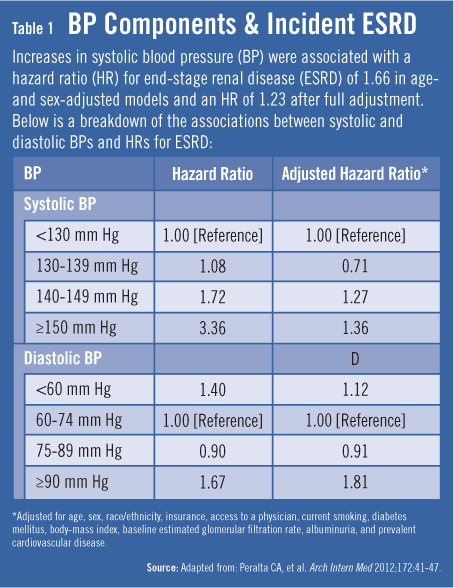 The results confirm that higher BP levels are associated with higher risk to develop ESRD. Most strikingly—despite dissemination of guidelines—the study found that more than one-third of patients with CKD had BPs of 150/90 mm Hg or higher, mostly due to isolated high SBP (Table 1). “The prevalence of uncontrolled hypertension was very high among people with CKD,” Dr. Peralta adds. “This was largely explained by isolated systolic hypertension.” Higher SBP was associated with higher ESRD risk, and this risk appeared to start at 140 mm Hg rather than at 130 mm Hg (the current target SBP for CKD). Furthermore, higher pulse pressure was associated with higher ESRD risk. 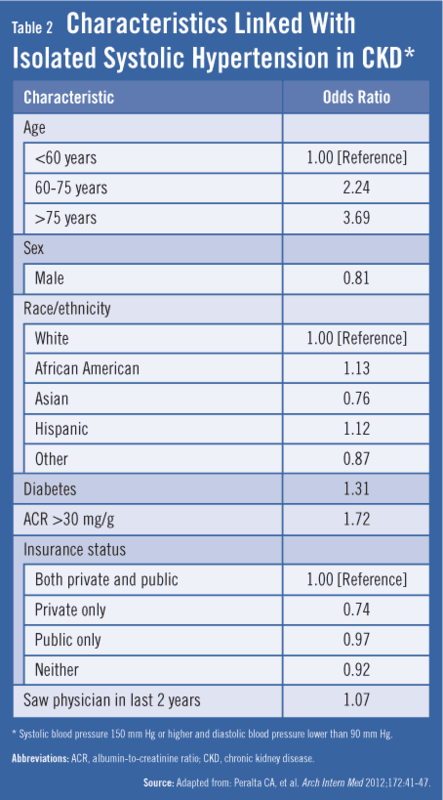 People with SBPs of 150 mm Hg or higher and DBPs of less than 90 mm Hg were more likely to be older, non-Hispanic black, and have diabetes and albuminuria (Table 2). A better understanding of the association of BP and ESRD risk among persons with CKD might help physicians provide better care for their patients with CKD, says Dr. Peralta. “The issue is daunting when more than one-third of persons with CKD are walking around with BPs higher than 150 mm Hg. Our study suggests that trying to get BP to less than 140 mm Hg may be beneficial in reducing ESRD risk.” Randomized trials have shown that lower goals (less than 130/80 mm Hg) reduce ESRD risk for persons with proteinuria, notes Dr. Peralta. “However, this lower goal can be especially hard for patients to achieve in clinical practice. Clinicians should focus more on patients with the highest and most uncontrolled BPs rather than be compelled to reach a goal of 130/80 mm Hg in everyone with CKD. More attainable BP goals may ease some of the challenges faced by physicians.” BP goal revisions might also enable physicians to prescribe fewer BP medications and focus more on other aspects of care. Greater efforts on patient education regarding BP control may also be of benefit. Peralta CA, Norris KC, Li S, et al. BP components and end-stage renal disease in persons with chronic kidney disease. The kidney early evaluation program (KEEP). Arch Intern Med 2012;172:41-47. Available at: http://archinte.ama-assn.org/cgi/reprint/172/1/41. Agarwal R. Blood pressure components and the risk for end-stage renal disease and death in chronic kidney disease. Clin J Am Soc Nephrol. 2009;4:830-837. Peralta CA, Hicks LS, Chertow GM, et al. Control of hypertension in adults with chronic kidney disease in the United States. Hypertension. 2005;45:1119-1124. Peralta CA, Shlipak MG, Wassel-Fyr CL, et al. Association of antihypertensive therapy and diastolic hypotension in chronic kidney disease. Hypertension. 2007;50:474-480. Hsu CY, Iribarren C, McCulloch CE, et al. Risk factors for end-stage renal disease: 25-year follow-up. Arch Intern Med. 2009;169:342-350. Sarnak MJ, Greene T, Wang X, et al. The effect of a lower target blood pressure on the progression of kidney disease: long-term follow-up of the Modification of Diet in Renal Disease Study. Ann Intern Med. 2005;142:342-351. Carmen A. Peralta, MD, has indicated to Physician’s Weekly that she has no financial interests to report.